The Associazione Edoardo Benvenuto has announced two days of study in honour of Edoardo Benvenuto, 7 - 8 June 2011, at the Faculty of Architecture, Genova. The program for Tuesday 7 June includes the awards for 2009 and 2010 of the Premio Edoardo Benvenuto to Federica Ottoni, Matthew J. de Jong and Carlo Guastini. The highlight of the day will be this edition of the Benvenuto Lectures, to be given this year by Werner Oechslin of the ETH-Zurich. including talks by Antonio Becchi, Piero Villaggio, Salvatore D'Agostino, Mario Como, Luigi Gambarotta, Andrea Bacigalupo, Stefano Bennati, Riccardo Bassotti, Danila Aita, Antonio Tralli, Elio Sacco, Anna Sinopoli, Massimiliano Lucchesi, Miroslav Šilhavý, Nicola Zani, Silvia Briccoli Bati. The program in .pdf can be downloaded by clicking here. I'm very pleased to send news about two new publications by authors who are part of the Nexus community. 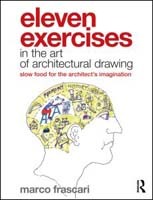 Marco Frascari, who presented a paper at Nexus 1998 in Mantua, has recently published Eleven Exercises in the Art of Architectural Drawing (Routledge, March 2011, ISBN 978-0-415-77926-5). Subtitled "Slow Food for the Architect's Imagination", the aim of the book is to discuss the crucial role of architectural drawings. More information can be found on the website of Taylor & Francis. Vera Spinadel, who was also a presenter at Nexus 1998 in Mantua, has recently published two new books. From the Golden Mean to Chaos (3rd edition – Nueva Libreria – June 2010 – ISBN 978-987-1104-83-3) is an updated edition of her book published in 1997. Forma y Matematica – La familia de numeros metalicos en diseño (Ediciones Fadu – Nobuko – 2011 – ISBN 978-987-584-319-6) contains the main post-graduate monographs to approve the seminar she has delivered every year since 2008 for the master’s program in “logic and technics of form” – Faculty of Architecture, Design and Urban Planning – University of Buenos Aires, with the assistnace of professionals from many South American countries (Colombia, Venezuela, Peru, etc.). Congratulations to these authors! We'll be looking forward to reading reviews of these books soon in the Nexus Network Journal! The Nexus conferences for architecture and mathematics are very pleased to congratulate Portuguese architect Eduardo Souto de Moura, who was a keynote speaker at the Nexus 2010 conference in Porto, for having won the 2011 edition of the Pritzker Prize. One of Architect Souto de Moura's outstanding projects is the Braga Municipal Football stadium, which was toured by Nexus participants. Thanks go to Porto organizer João Pedro Xavier for having invited Souto de Moura to address the conference, making it possible for us to hear him talk about his projects in person. Information about the 2011 Pritzker laureate, including a splendid photo gallery, can be found on the Pritzker Architecture Prize website. The 2012 edition of the Nexus conference on architecture and mathematics includes a competition for the logo. The conference logo will appear on the website, on all printed announcements and posters concerning the conference, and on all conference material, and a special webpage on the conference website will provide space for the winning designer to explain the concept and process behind the creation of the logo. All competition entries will appear on a website. A selection of the best entries will be exhibited during the Nexus 2012 conference. The logo should capture the "nexus" of architecture and mathematics, the interdisciplinary subject of the Nexus conferences. Past logos for Nexus conferences from 1996 to 2010, as well as competition submissions for the 2010 logo competition can be found on the Nexus 2010 logo webpage. References to the conference venue in the city of Milan are also appreciated. Designers should remember that the logo design should be meaningful at a variety of scales, from full-size to thumbnail, and that it will be used on the cover of a future issue of the Nexus Network Journal (about 12 cm x 12 cm, or 5 x 5 in), and will appear online as well. Scaling the image up and down during the design phase will help the designer be sure that the logo is readable in all formats. The competition is open to all those who would like to submit a design. Teachers are particularly encouraged to use the competition as a starting point for a class project. Logo proposals should be submitted in digital format (.jpg or .gif) in a low resolution (96 dpi) on a page size no larger than a standard A4 page (210 x 297 mm). The winner will be asked to send the winning image in an uncompressed format (.bmp or .tif) at a 300 dpi resolution. The proposal can be accompanied by a short (one-paragraph) explanation about how the image was created and what it is intended to signify (but remember, the image should really speak for itself, making the "nexus" of architecture and mathematics clear without needing any verbal explanation. Please include a coversheet with the candidate’s name and contact information. Logo proposals must be submitted no later than 31 December 2011 for review and selection. Proposals will be posted on the website before the winning design is announced. The winner will be notified by 31 January 2012. I'm very pleased to send news about three new publications by authors who are part of the Nexus community. Paulus Gerdes, whose paper "On Some Geometrical and Architectural Ideas from African Art and Craft" appeared in the book Nexus II: Architecture and Mathematics" rom the 1998 Nexus conference, has just published the color version of his book African Pythagoras: A study in culture and mathematics education. It is available as in print and as a download from: http://stores.lulu.com/pgerdes. Our Nexus community is really productive! Congratulations to these authors! I am pleased to forward to Nexus Network Journal readers the announcement of the important conference announced by Matt Cohen of Washington State University. Leiden, The Netherlands, 17-19 March 2011. The conference will feature twenty-eight speakers, some of whom have published in the NNJ, including Mark Wilson Jones and Volker Hoffmann. The conference will also host Howard Burns (keynote) and a prerecorded video interview with James S. Ackerman. Congratulations to Matt on organizing such a fine event!